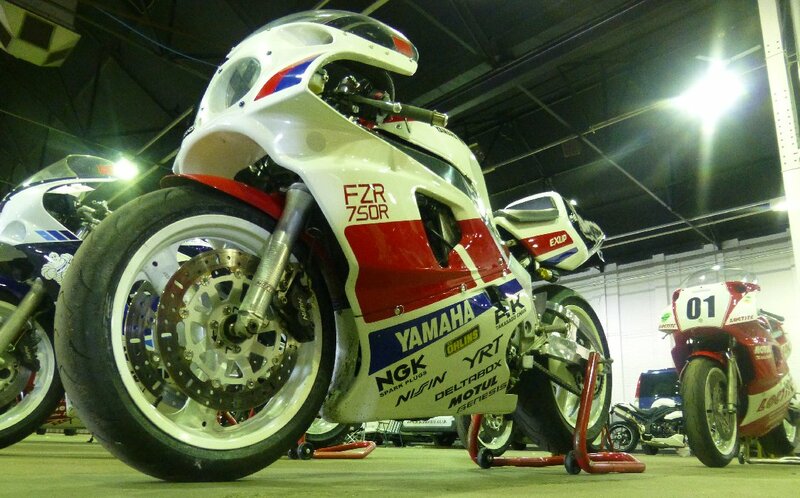 We'd been planning to do a Homologation meet this year, along the lines of the previous SmokeFest but for all the limited-edition 750's. Meet up, chat, go for a ride, take some photos etc. 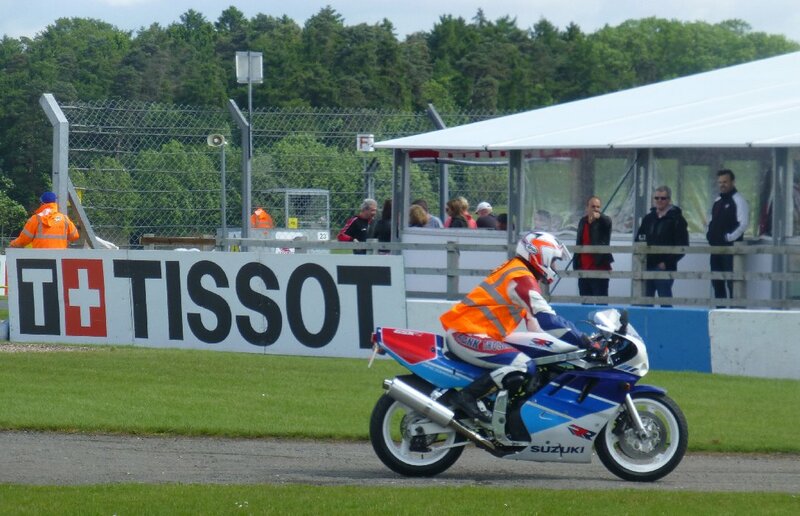 Then Andy Bolas from the VJMC made it easy for us, by inviting us to bring our bikes along to their display at the World Superbike weekend at Donington Park. 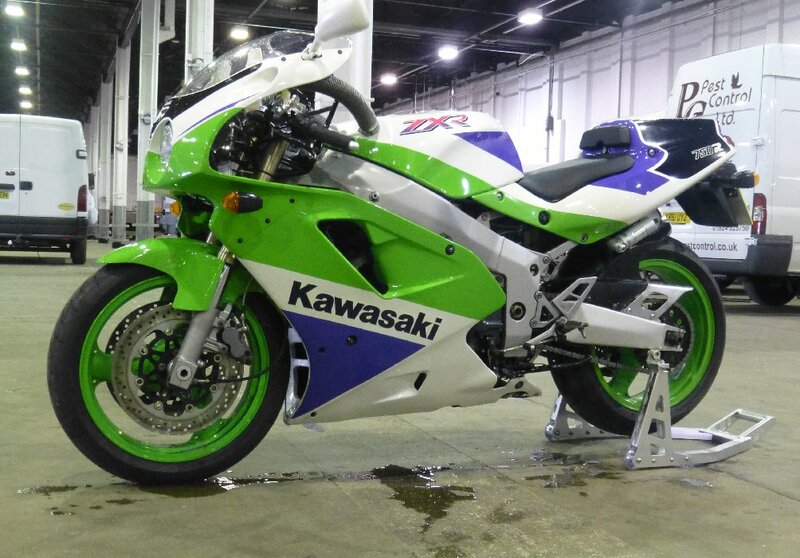 Tim said yes and immediately gave his GSX-R750RK a long-overdue clean. 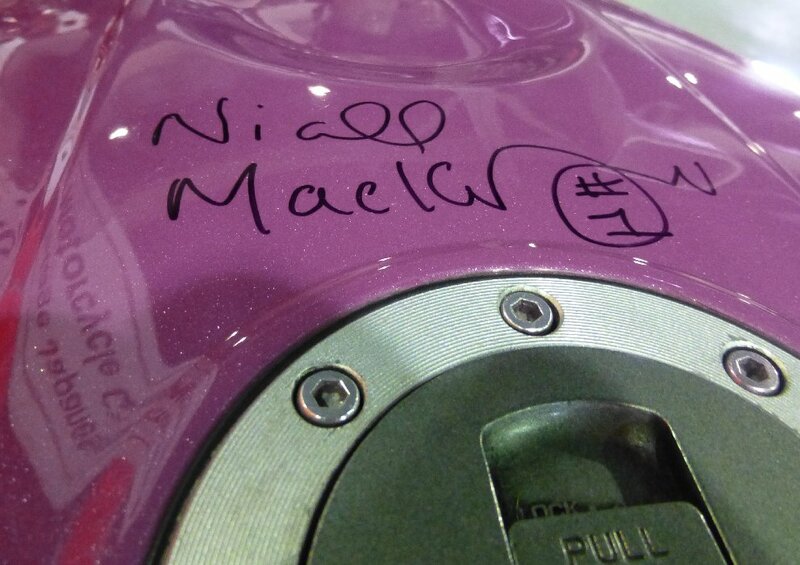 Rob E also signed up with his mint ZXR750R-K1. 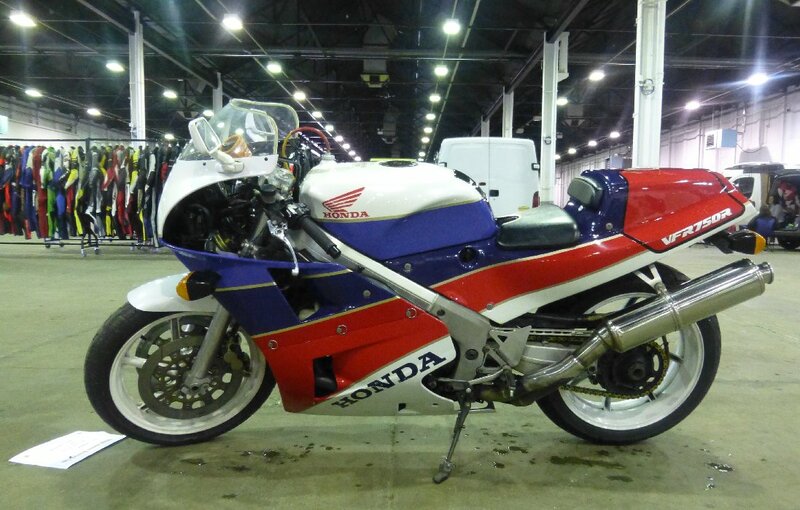 Despite a garage full of eligible bikes, Darin couldn't make this one and Rob B's RC30 was on full-time duty as a lounge ornament so he was absent too. A very early start on Saturday saw some bleary eyes roll up to the gate at 8:30am. We had no tickets/passes of any sort and were expecting hassle off security as all the WSBK punters were arriving at the same time. 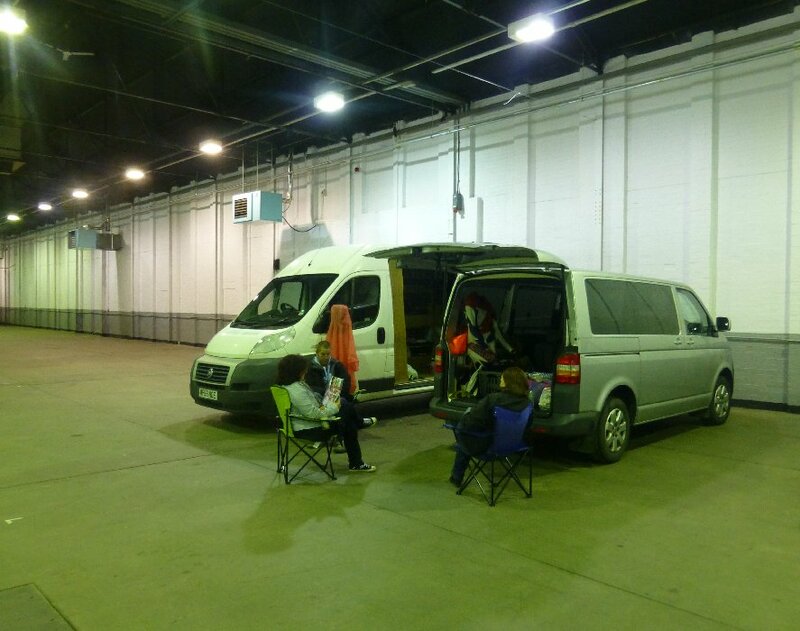 But they just waved us into the exhibition centre where there was a bunch of exotic bikes already assembled, and a motley collection of vans and caravans lined up at the back. The big orange VJMC tent provided somewhere to sit and chat - on one side were a dozen homologation specials, on the other a selection of the usual VJMC fare. 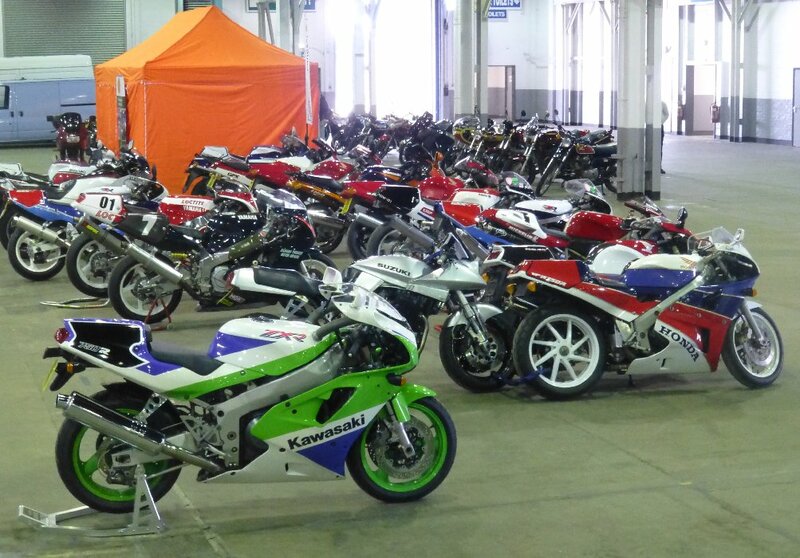 The only other 'attractions' in the exhibition centre were traders selling WSBK merchandise and secondhand leathers. And bloody airhorns, which got very annoying very quickly. 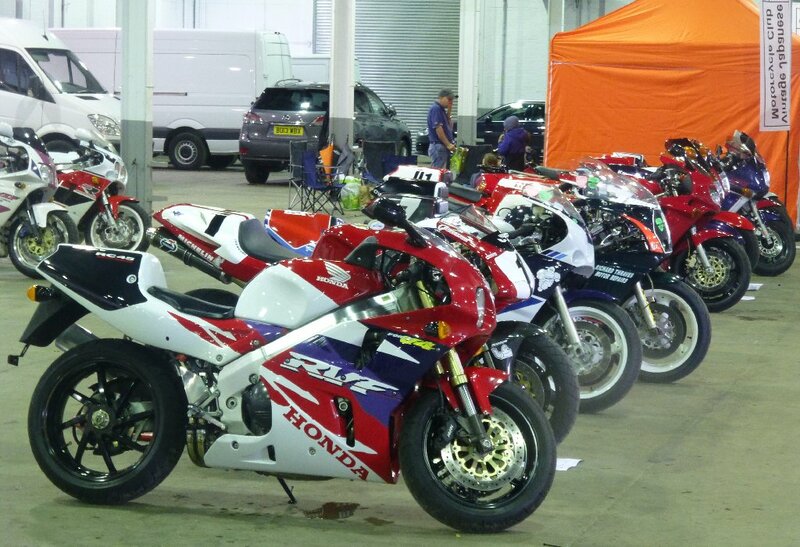 There was another RK already there, along with an RC30, RC45, Ducati 916, three OW-01's and a couple of non-SP YZF's. 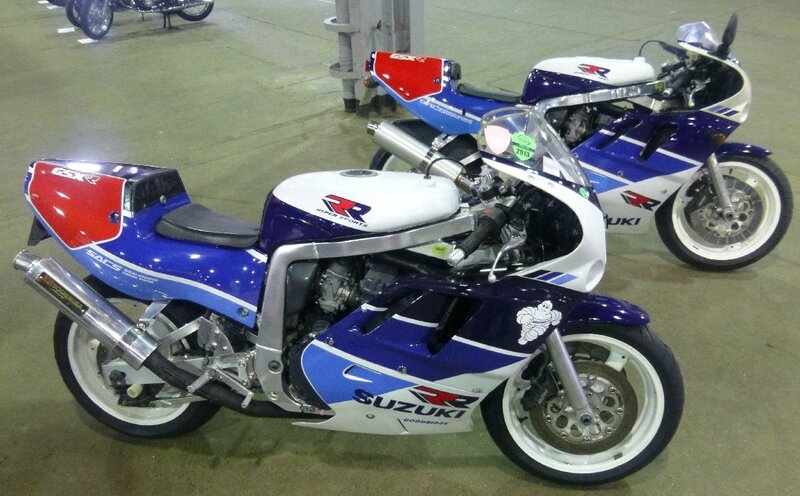 Also present in the line-up were a GSX-R750L, VFR750, GPX750, GPZ1000RX and ZZR1100. 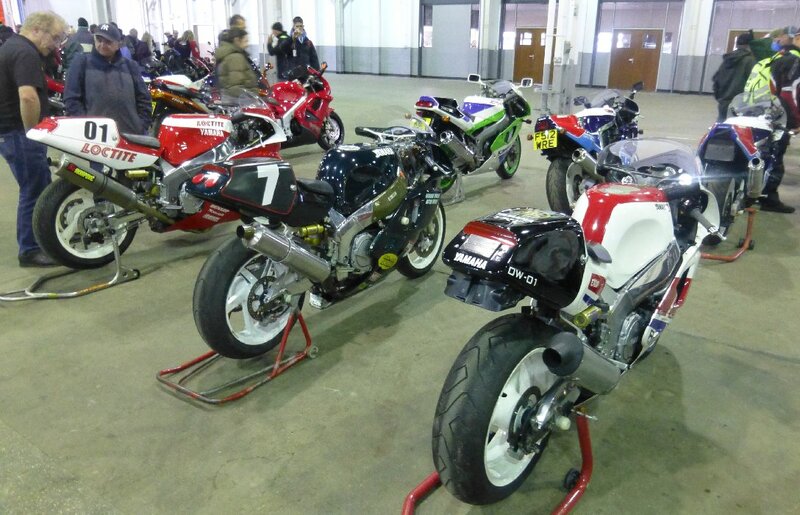 The WSBK organisers had asked for a selection of appropriate bikes to do a couple of parade laps on both days and the rest of the time the bikes were on show for the passing punters to admire. 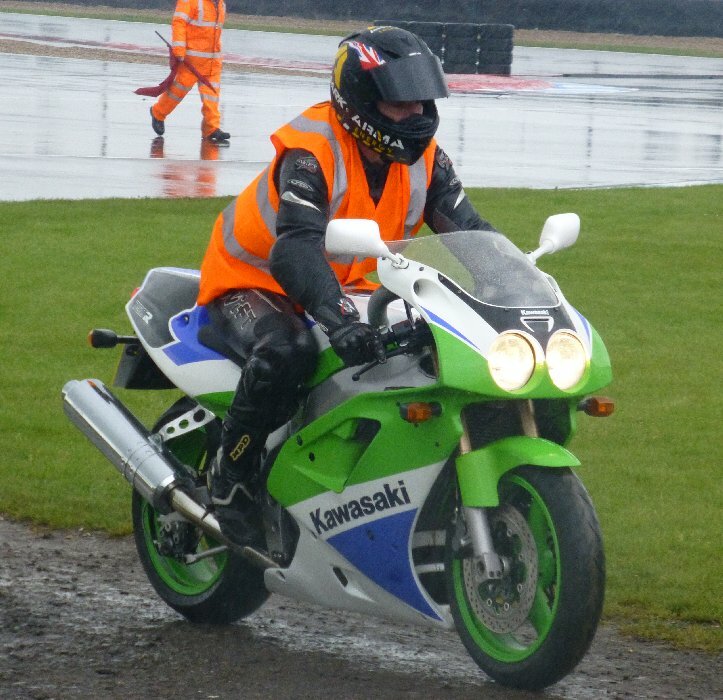 Saturday was wet and we had a soggy walk out to the infield to absorb all the glamour of WSBK. Which was notable by its absence. 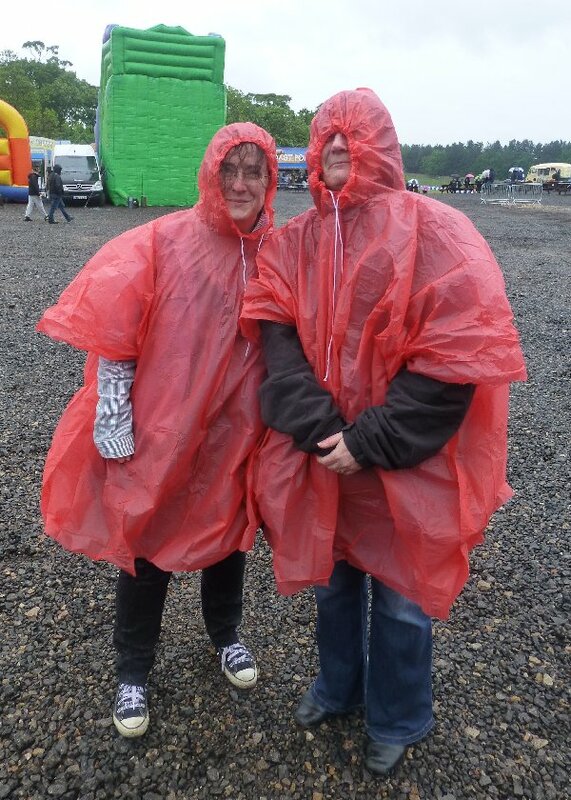 Maybe if we'd splashed out on pit/paddock passes we could have seen something other than burger vans and grim-faced race fans cowering under their brollies. 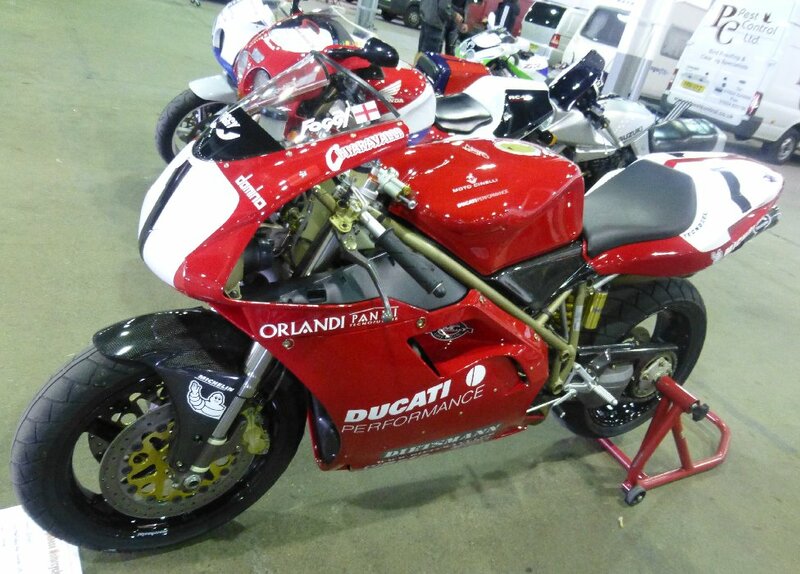 We did see Foggy nipping into the Ducati hospitality suite for his prawn sandwich though. 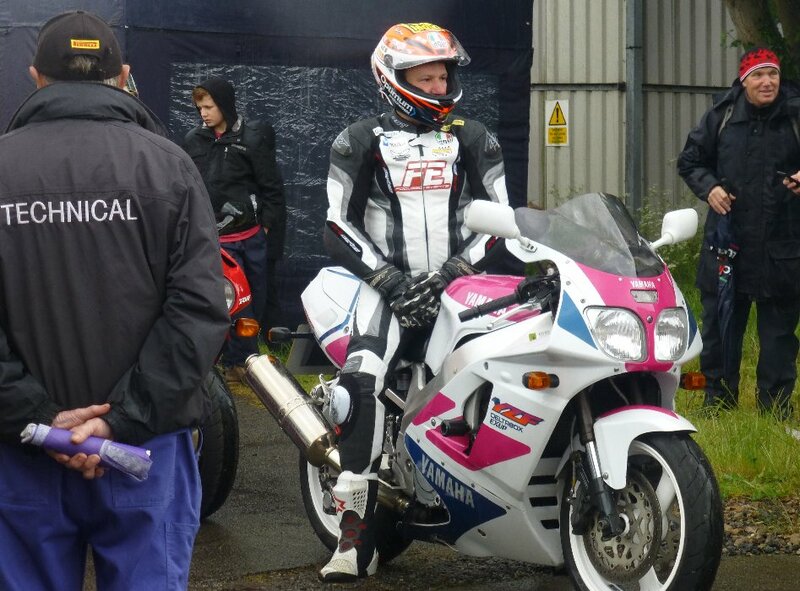 The scrutineers had to check each of the parade bikes and stuck a qualifying sticker on each frame. 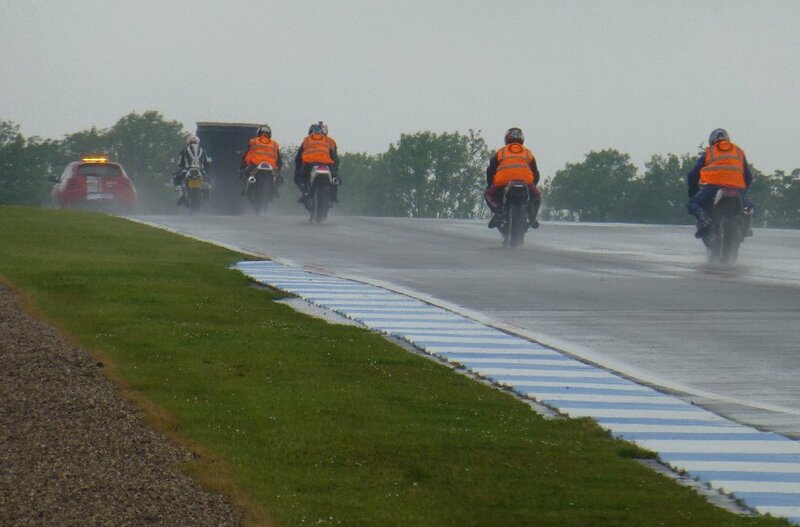 Because of the weather, not all the bikes went out for the parade laps at 2pm though. 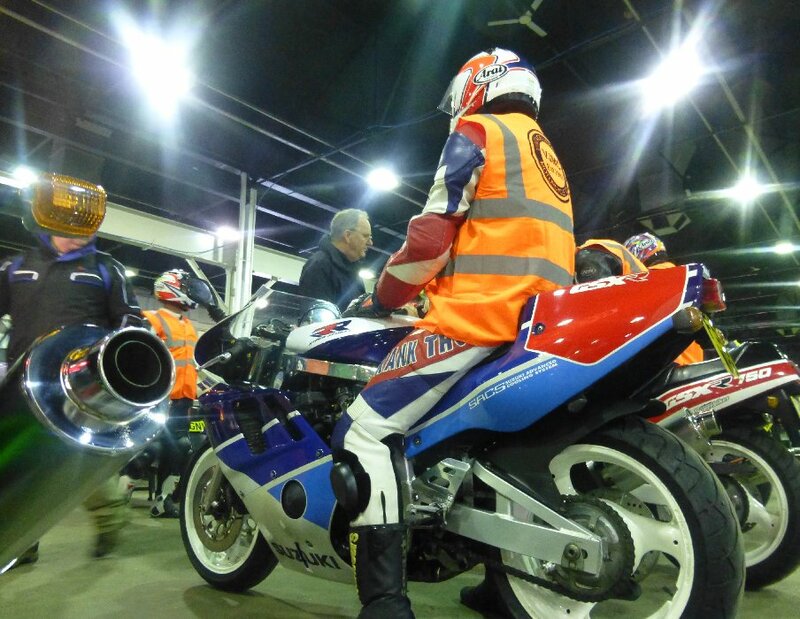 Rob and Tim reluctantly slipped the mandatory VJMC dayglo vests over their leathers and after a 1-minute safety briefing, joined the queue of riders pushing their bikes out of the hall to the assembly area. Splashing through the puddles they made their way onto the track, behind an Alfa 4C safety car and Niall McKenzie on a borrowed YZF. 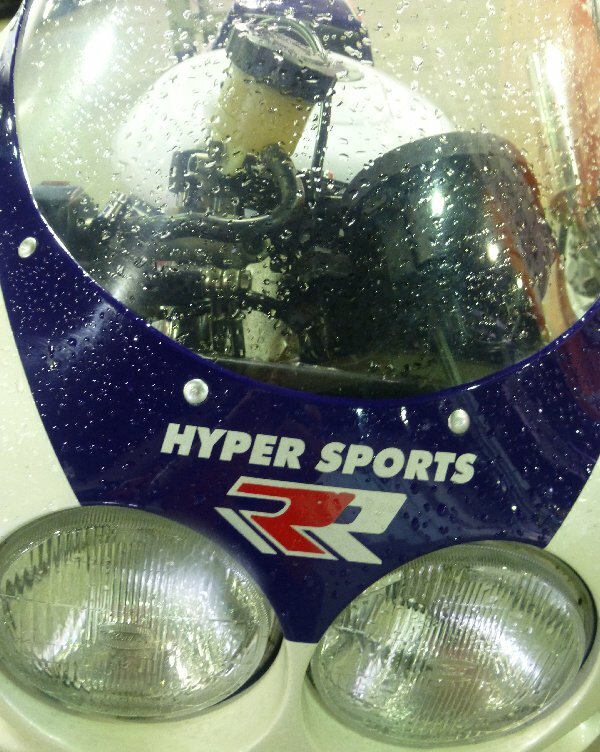 It was raining pretty hard and two steady laps were enough. 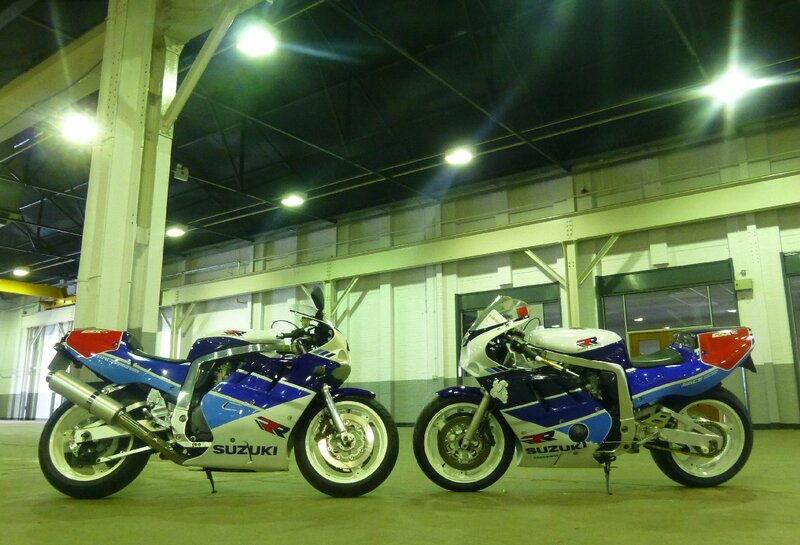 Riding back into the hall, the bikes sat there steaming and puddles began to forum underneath each one. The polishing cloths re-appeared. After a comfortable night in a 4-star hotel (sleeping in the vans had been an option) we arrived at 9:15am and again were quickly waved through into the hall. Nic rustled up coffee and bacon sandwiches. 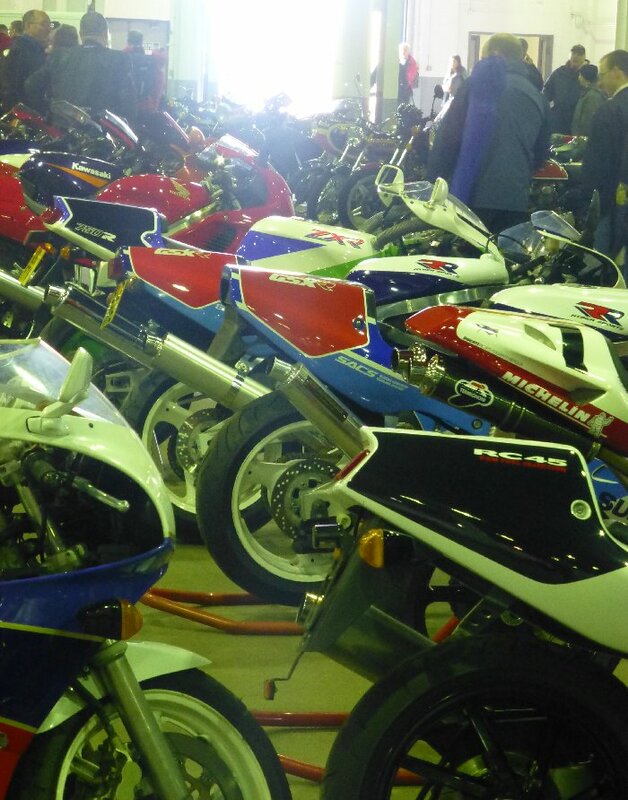 The parade laps were scheduled for 11am Sunday and - maybe because the weather was sunny and dry - more bikes lined up this time. 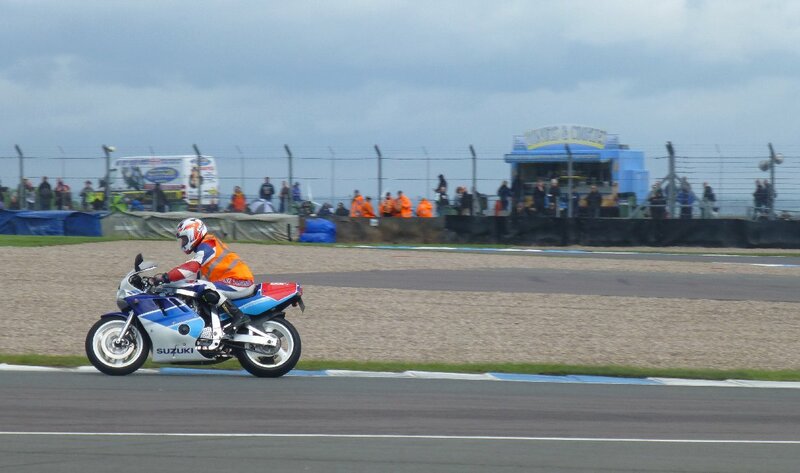 No-one remembers a GSX-R1100-engined Katana special competing in WSB but he was grabbing his chance for a free ride round Donington and who can blame him ? Niall led the way again and the pace was faster on the dry track. 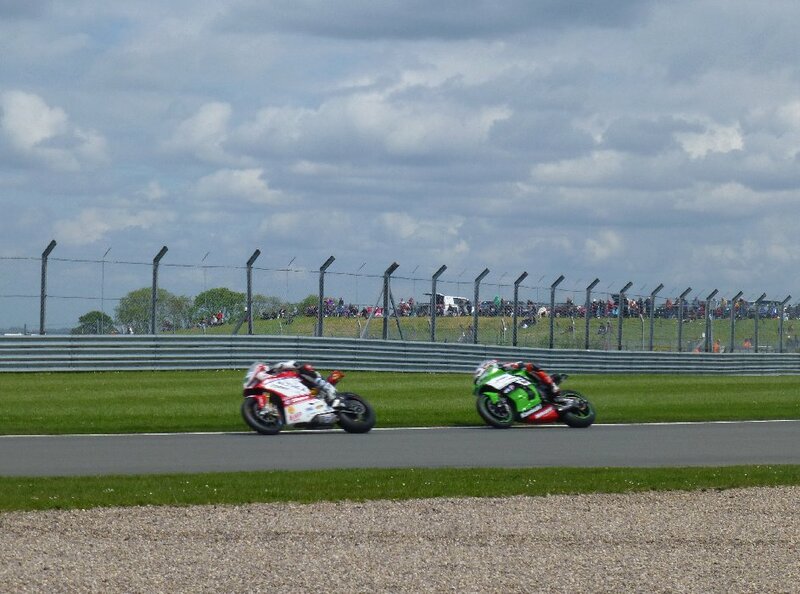 Only two laps again but it was way more fun this time and it felt pretty special with everyone watching. Tim wisely resisted the temptation to wave to the crowds. No-one fell off. 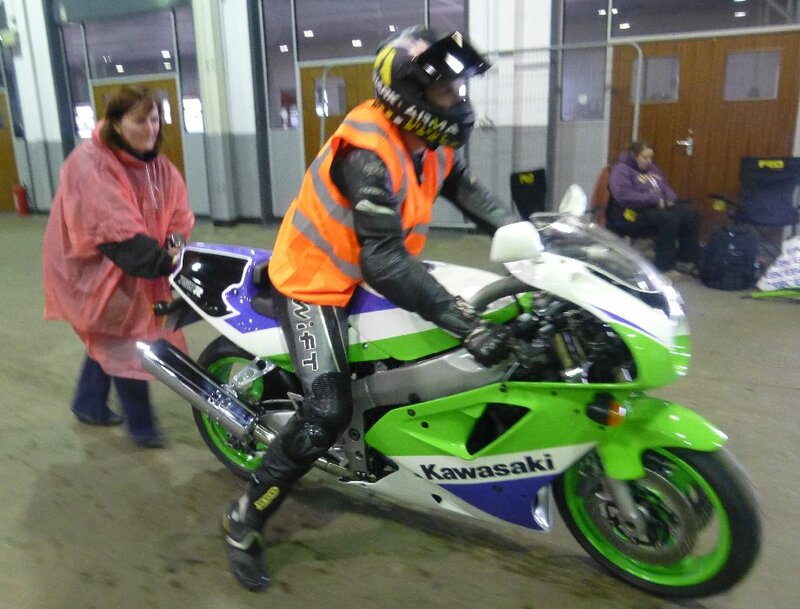 Back in the hall, someone pointed out that Rob's ZXR had a subframe bolt hanging out - nice scrutineering ! The bikes were not roped off in any way and it was very stressful watching people carrying umbrellas and deckchairs wandering around between them. 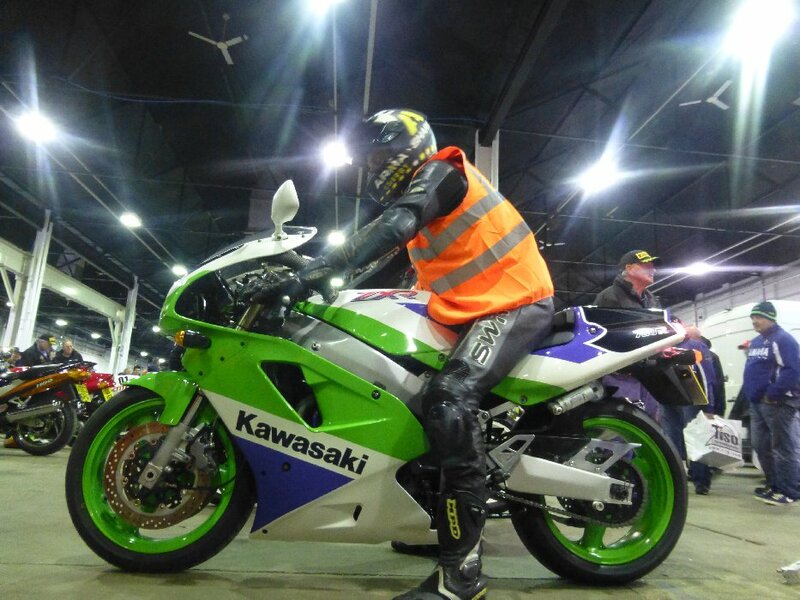 It got very quiet in the hall when the main racing started later so we took the opportunity to wander up the back straight and watch Tom Sykes win a double Kawasaki 1-2 on his ZX10R. In anticipation of getting caught up in the traffic as everyone left, we loaded the vans up early and set off home at 3pm. This was a different type of event for us but we'd happily do it again if we got the chance. 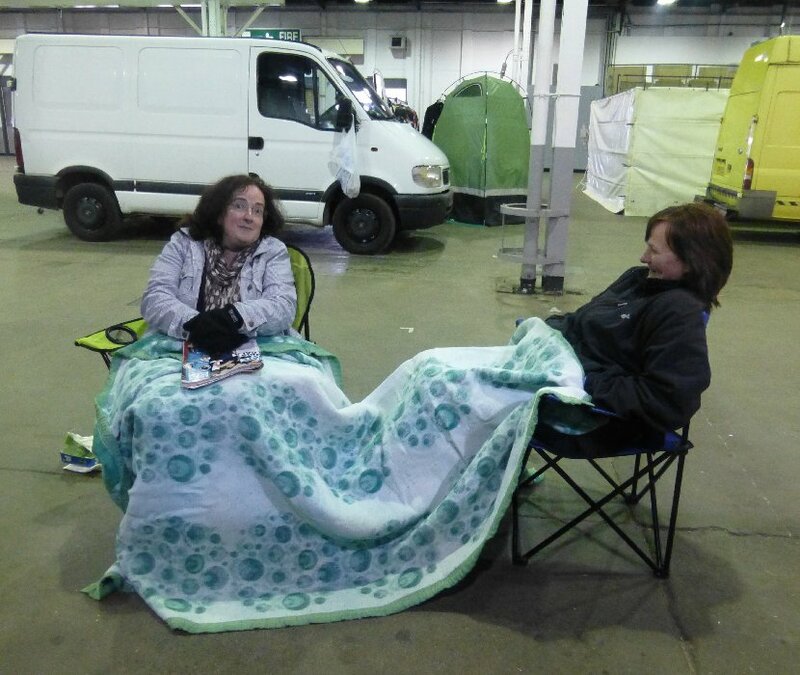 It was quite a lazy, sociable affair and it was great to catch up with people without feeling 'on duty' all weekend. 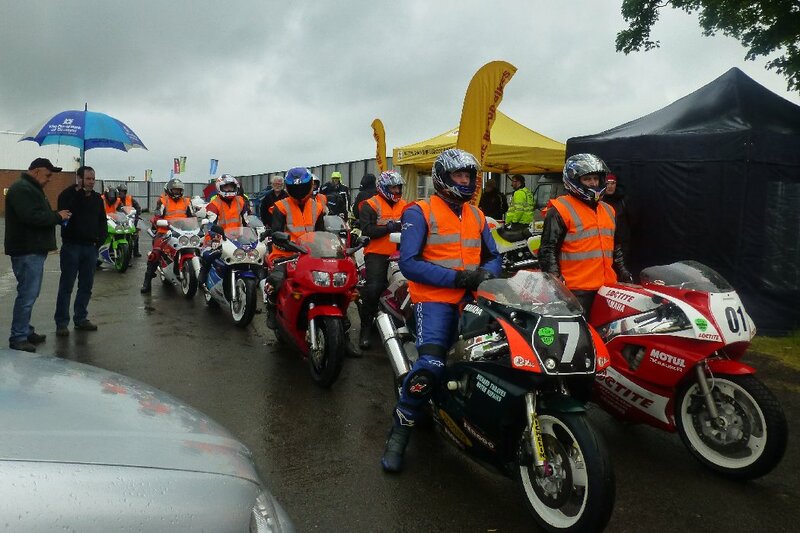 Big thanks to Andy and the VJMC for letting us join in, and to Sara for the photos.